Just over one million people in this country call a skyscraper home today. The vast majority (nearly 700,000) of condo dwellers can be found in our largest urban centres, including Toronto, Vancouver and Montreal. Existing condos currently account for about 15 per cent of total housing in the Big-Three cities, and just over 8 per cent nation-wide, according to Royal Lepage. But, like the Toronto skyline, that ratio is expected to change dramatically over the next few decades.Driven largely by affordability and steady immigration into core urban centres, high-rise condos already account for about 40 per cent of new-home construction in our largest cities. That's expected to reach 51 per cent in the last half of this decade, and 54 per cent by the end of the 2020s. There’s something larger going on here, too. Turns out, high-rise living, and its associated perks (the onsite fitness centres, rooftop patios and relative ease of living and working in the same neighbourhood), is not just a palatable option for Canadians, but increasingly desirable. “Clearly the pendulum has swung towards this style of living,” said Phil Soper, CEO of Royal Lepage. “It (condominium living) is destined to be the dominant form of housing, particularly in our dominate cities,” he said. Vancouver may be best-known for its sea of blue-glass towers glittering like jewels across the city’s downtown core, but no Canadian city has seen the kind of radical makeover quite like Toronto has in recent years. 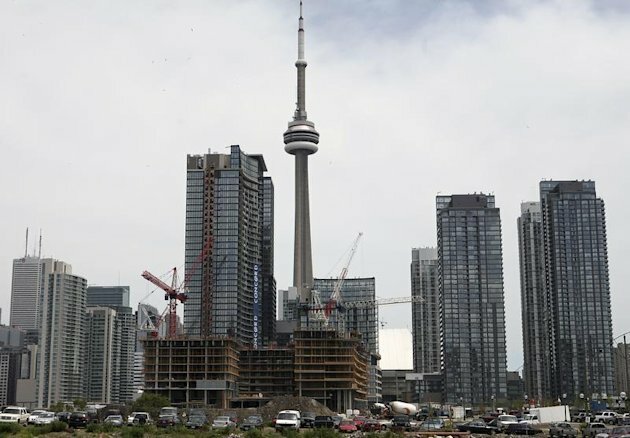 With 130 projects underway as of January, Toronto has more skyscrapers and towers under construction than any other North American city, according to Emporis, a website that compiles building data. New York City, by comparison, has 91 buildings under construction, with Montreal in distant third place with 25 high-rises going up. In 2012, Toronto’s high-rise construction nearly doubled that in the Big Apple, Emporis reported. The overwhelming majority of the towers are residential buildings. Toronto's construction boom has certainly sparked fears of a potential bubble, as a whopping 40,000 new units are expected to come on stream over the next two years alone. In April, Scotiabank released a report predicting a softening in the overall housing market this year, as soaring prices temper home sales and builders scale back the number of new projects, particularly condominium towers. Earlier, the Bank of Canada warned that a glut of unsold condos in Toronto could destabilize the whole housing sector and drag down the country’s economy. But if that's scaring off buyers, no one told them. Toronto condo sales had their best March on record this year, helping to drive first-quarter sales up 68 per cent from a year ago, Bloomberg reported. Prices dipped to $548 per square foot in March from a record high of $559 last month while the average unit was 797 square feet, up from a record low of 784 in February, according to Bloomberg. Soper said demand remains surprisingly strong, adding it may take an uptick in the cost of a mortgage financing before we see some slowdown in the sector. “We are well into the period where we thought (completed condo units) would outpace demand and it hasn’t occurred yet,” he said.